Norway's head of intelligence Janne Kristiansen has handed in her resignation because she said too much during a parliamentary hearing. Justice Minister Grete Faremo told reporters that a "potential breach of confidentiality is a very serious matter". According to a transcript, Ms Kristiansen told the hearing that Norway had agents working in Pakistan. 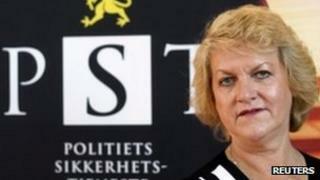 Ms Kristiansen resigned late on Wednesday night after meeting the justice minister. A ministry spokesman told the BBC News website that the Norwegian Police Security Service (PST) chief had "drawn her own conclusions". Head of the PST since November 2009, Ms Kristiansen had already raised eyebrows when she argued that the service could not have been in a position to prevent the bomb attack and shootings carried out by Anders Behring Breivik in July last year. "Even East Germany's Stasi [secret service] would not have been able to detect this person," she told Norwegian TV after the twin attacks in which 77 people died. She later apologised for the comments. Norway has 400 troops in Afghanistan as part of the Nato-led force and Ms Kristiansen was apparently asked at the parliamentary hearing about the PST's links with neighbouring Pakistan. In the transcript, she answers a question from MP Akhtar Chaudhry about the extent of the PST's links with Pakistan. Although she indicates that the PST does not have its own relationship with Pakistan intelligence, she says the Norwegian armed forces' intelligence agency, or E service, does. "The E service has its representatives in these countries, so we co-operate via the E service about this country." Norwegian media say army intelligence has never confirmed operating agents in Pakistan. Unconfirmed reports also say the Pakistan authorities have summoned Norway's ambassador in Islamabad to explain Ms Kristiansen's remarks.